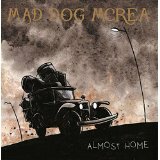 Mad Dog Mcrea hail from Plymouth, Devon and comprise: Michael Mathieson – guitar & vocals, Dan Crimp – whistles & flute, Jimi Galvin – bass, Dave Podmore – Bazooki & banjo, Pete Chart – drums & Nicki Powell – Fiddle. But that line up of instruments doesn’t even begin to describe the rich fruitiness of the energetic soundscape they create. A heady punch of mainly uptempo folk, acoustic rock, gypsy strains of bluegrass and jazz touches, with some Brit humour and delivery. They also have some rock’n’roll anecdotes and a buccaneering approach to music, throwing lots of influences into the pot and creating something very listenable from it. They have a good reputation as a live gigging band, having done at least their fair share of festivals and are currently on tour;” Almost Home” translates their live energy well to digital. I don’t know who the writing talent is in the band but the overall sound is very collaborative throughout. The arrangements aren‘t necessarily straight-ahead but they are not meandering either. Sean Lakeman takes credit for the even and bright production. As well as local nods (“Devonside”) and peopled by gangsters, pirates, faeries and gypsies and the themes are quite diverse from the tunnellers of WWI(“You Can’t Find Me”) to the comically romantic “Cher”. Overall it’s a good listen that entertains and uplifts. I should imagine this would be a good drinking soundtrack, though there are cautionary tales about alcohol use, and a tinge of melancholy, “The Sound”, for home time.